Based on over forty years of combined author experience as portfolio managers and financial advisors, Divorcing the Dow presents a timely framework for understanding and investing in market cycles. Authors Jim Troup and Sharon Michalsky believe that the Dow Jones Industrial Average is no longer a relevant indicator of market performance; in fact, they feel that watching the Dow may actually obscure indications that the financial markets are poised to experience a boom that dwarfs anything seen before. Based on in-depth research and field-tested in their own successful management of millions of dollars in personal and corporate assets, Divorcing the Dow introduces investors to a revolutionary paradigm for assessing the markets and making investment decisions. Troup and Michalsky's approach focuses on analyzing patterns of productivity as a way to anticipate market cycles and investment potential-and with this book they've outlined how investors can begin to recognize these patterns themselves. 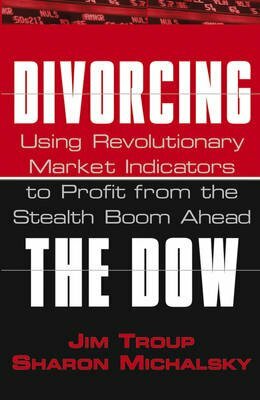 Divorcing the Dow provides investors with a new framework for thinking about financial markets and gives readers specific investment techniques to anticipate the market's direction and identify companies poised for sustained productivity and long-term growth. Jim Troup (Sarasota, FL) is First Vice President, Financial Consultant, Portfolio Manager, and Corporate Client Group Director at Smith Barney. A twenty-four-year finance veteran, Troup has worked with leading investment firms including E.F. Hutton and Merrill Lynch, and lectures extensively on portfolio management and asset allocation. SHARON MICHALSKY is First Vice President, Financial Consultant, Portfolio Manager, Corporate Client Group Director at Smith Barney, where she began her career nineteen years ago. She has attended The Wharton School and is the guest speaker at many professional forums where she lectures on investment methodology and portfolio management.